The skyscraper is architecture’s ultimate icon. 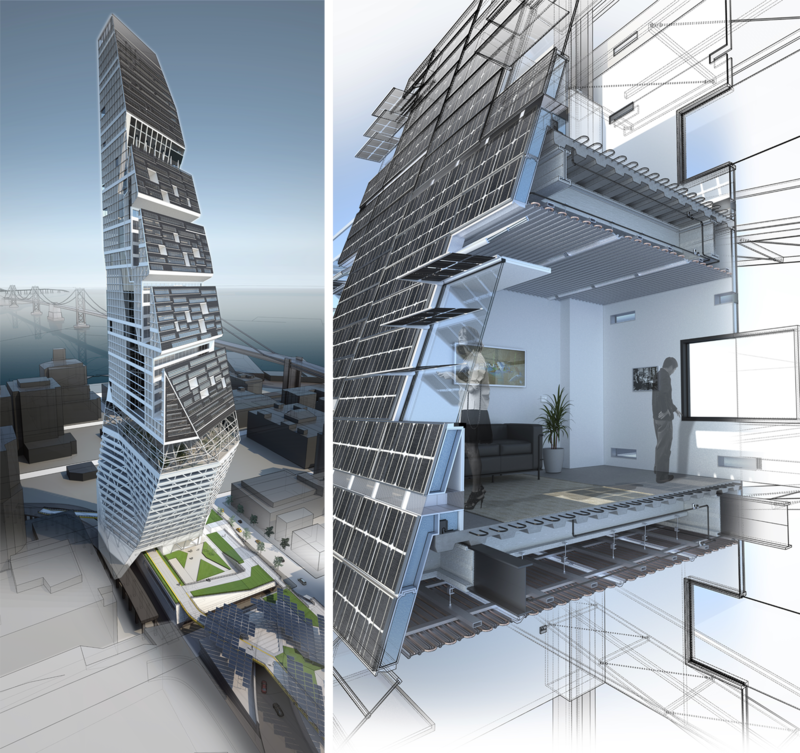 The term itself conjures images of seemingly impossible, awe-inspiring loft, and as a design proposition the skyscraper raises some of architecture’s biggest questions. Is it possible for a sense of community to develop among inhabitants of a vertical, stratified environment? Is urban density even desirable? What is the essence of a slender form? In addition to contemplating these questions, the skyscraper architect must solve a number of technical problems as a prerequisite to building tall, all essentially rooted in the force of gravity. In a way, the evolution of the skyscraper has been guided by technical innovations aimed at conquering the earth’s most basic force. One could arguethat two of these innovations, the invention of the elevator and the development of the steel frame, have had more physical impact on the planet than the digital computer. As these technologies have progressed, especially the ability to model mathematically every conceivable structural form, the imagination of the architect has become increasingly unbridled. Nonetheless, the practical realization of an innovative skyscraper design is relatively rare. Despite engineering innovations, the design constraints remain formidable, especially the economics of building tall. Perhaps this is why many of the world’s best architects have never designed a really tall building. Add to the issues cited above another big question: Is it possible to build a truly sustainable skyscraper? The buzzword of the first decade of the 21st century is sustainability; a term still seeking definition, to be sure. The media is full of reports about clean energy generation, sustainable transportation, and recycling, but relatively little is written or discussed concerning the single largest consumer of energy: buildings. Why is that? Sustainability, however it is defined, is essentially an ethical question. No one disputes that the embodied energy required to build a skyscraper is enormous, but is it worth the effort? If sustainability is narrowly defined as “off-the-grid” or “energy neutral”— that is, the building must generate as much energy as i t consumes in its daily operations — the effort seems worth the result. The power loss from a remote point of generation to its site of consumption is typically greater than 50 percent, which alone justifies the effort to strive for energy neutral buildings. However, if sustainability is defined as a building’s total carbon footprint, including the energy required to extract and /or recycle its materials, fabricate its components, erect it, and operate it, the equation is quite different. Perhaps the goal of a truly sustainable building is to be a power plant of sorts, connected to the grid, generating enough energy to serve its own needs and also pumping enough back into the grid to make up for the carbon that was emitted to build it. Often overlooked are nontechnical questions surrounding the issue of sustainability. What defines aesthetic sustainability — what a sustainable building should or solar heated radiant flooring from water heated on PV panels could look like?Would people inhabit a building if they had to compromise their current lifestyles and habits, or if it would cost more? These questions are much more difficult to answer than the technical questions. An architect could hide behind sustainability indefense of a design that was awkward or ugly. A wind turbine plopped on top of an ill-conceived structure does not suddenly make it beautiful. On the other hand, every detail of a particular design could be conceived with an energy-generating and /or energy-conserving intent, and the result could still be pleasing to the eye, as with airplanes or sailboats, whose forms have been optimized for performance. Since a skyscraper does not need to fly through the air or speed through the water, however, there are no dominant form-determining drivers that guarantee a successful tower aesthetic based on technological criteria alone. The idea of a sustainable skyscraper has added a new slant to the question of whether there is even a need for tall buildings. Anti-growth movements have arisen in many cities, leading to height restrictions prohibiting tall structures. There are even those who have predicted the death of the skyscraper, based mostly on economics but also in part on a perceived negative impact of tall buildings on civilized society and the urban landscape. The fact that an entirely carbon neutral skyscraper may not be currently feasible because wind, solar, and other clean energy sources cannot yet generate enough power to reliably operate a large building has added one more argument against building tall. Nonetheless, many cities continue to build upward; research by smart-growth planners indicates that urban density is a desirable goal. In fact, it may be the only effective way to reduce transportation energy use and eliminate construction on pristine, undeveloped sites. The effort to build tall is worth it. These are large questions, which thoughtful architects may ask themselves but rarely have time to reflect upon deeply and meaningfully. Thus, they are questions for future architects — that is, the current students of architecture. In fall 2008, students in CCA’s comprehensive building advanced studio were asked to address these very questions. Although the students were eager to start designing, the studio began with a few preliminary exercises that posed the above questions and helped them come to grips with the magnitude of the issues. They were first asked to think about the relationship between form and logic by writing a brief essay based on statements by Frank Gehry, Louis Kahn, and Louis Sullivan. The idea was to have them establish a point of view about how sustainable technologies might take on formal expression. Next they were asked to map and model a 10-block section of an established San Francisco neighborhood, North Beach, rearranging and rotating its components into a vertical position. Lastly, they analyzed a number of successful modern skyscrapers, including the classic Hancock Building in Chicago, OEM’s CCTV Headquarters in Beijing , Santiago Calatrava’s “ Twisting Torso” in Malmö, Sweden, and two of Norman Foster’s buildings: 30 St. Mary Axe (“ the gherkin”) in London and the Commerzbank building in Frankfurt. The latter is well known for its sustainable features. These exercises, especially the North Beach problem, revealed the difficulty of creating a meaningful neighborhood vertically, in a single building. The studio space was transformed into a hive of creative activity over the first few weeks of the semester as the students constructed models, which were on average four feet tall. Although at this scale the models were not significantly encumbered by the gravitational field, issues of structure and vertical circulation became obvious. Many characterized North Beach as a flat version of an Italian hill town, replete with rich cultural attributes, and it was clear that these attributes could not be easily captured in a 50-story walk-up apartment building. 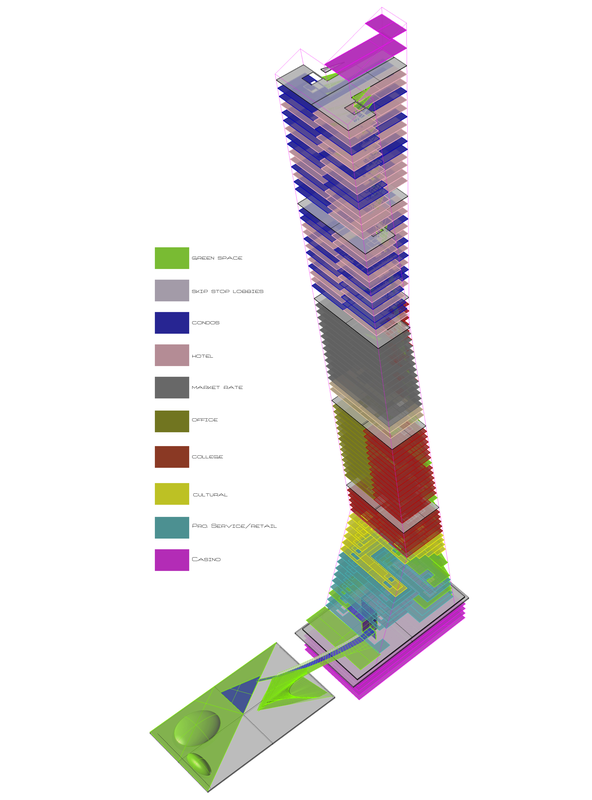 The students selected an approximate height for their skyscrapers, between 50 and 100 stories. They also defined a program for their de signs based on a set number o f possibilities, ranging f rom residential and office uses to commercial and institutional functions. All chose a mix of uses, partly as a reaction to the typical sterile office building, but also in an attempt to capture the spirit of place embodied in an established urban community such as North Beach — perhaps the future of vertical environments. The proposals varied widely. One design was based on an organic shape that had almost no relationship to the technical requirements of a skyscraper. Although the form and beauty of a flower are related to the forces that shape it, a building is subject to a completely different set of influences, a point made clear in this student’s design. Another was a birth-to-death environment within which the inhabitants could live their entire lives. Many struggled with the difficulty of getting light into deep spaces and how to suspend a sustainable green belt vertically. Some never did find a technical solution to the conflict between density and natural light. One design included a novel circulation system consisting of pneumatically driven pods that would allow movement in three dimensions in non-orthogonal ways, eliminating the need for traditional elevator shafts. For some, sustainable systems overlaid shapes conceived without regard to structure. An efficient structure will use less material than an inefficient one, so structural efficiency is important for a truly sustainable buildin. As a consequence, some students started with a somewhat conventional, efficient structural framework and then applied to it thermally efficient skins. One novel design proposed a structural frame comprised of components from the soon-to-be replaced San Francisco Bay Bridge — repurposed material on a grand scale. Almost all of the proposed skyscrapers were clad in some type of power generating skin or a thermally efficient skin comprised of multiple layers, including shading devices that would minimize solar heat gain. Only a few employed wind power, a difficult option f or a skyscraper unless turbines are positioned at intermediate levels. A number of the designs addressed the problem of water use in high-rise buildings. The most creative proposal included wastewater treatment in a series of cascading filter gardens, producing clear, potable water at the ground floor, which was then used to cool the entire building. The most compelling approaches, however, addressed the big questions head-on in ways only students — not being answerable to the real world of clients , approval boards , budgets , etcetera — could propose. The designs illustrated here are very convincing. Vertical communities have been created, density has been achieved, and building masses and skin textures have been informed by solar and wind orientation. Could these designs, if built , yield no carbon footprint? In other words, has a truly sustainable skyscraper finally been invented? Not quite yet. But the desire, as shown by the efforts of these students, is certainly there.